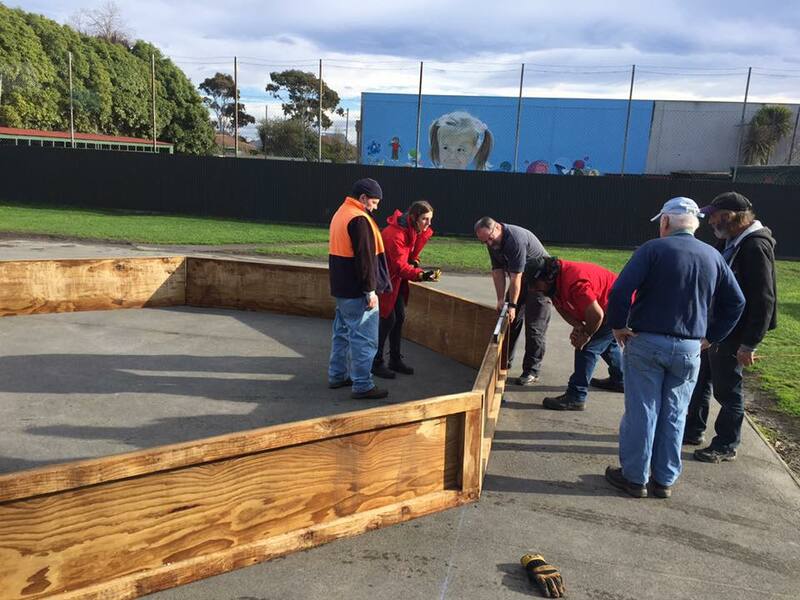 Bunnings Riccarton approached us to help with one of their community projects – building an Israeli / Gaga Dodgeball pit. They would provide the wood and provide some expert hands for installation if we could build the pit and get it ready fro them. Of course we said yes. The results of our efforts are shown below but the process we went through is worth documenting for those who may want to follow in our foot steps. After browsing around the Internet we chose to use the instructions found here at instructables.com The plan seemed reasonably straight forward and there were lots of pictures to show the way. Step Two – A Shopping List. The Instructables plan chosen was in Imperial measures ( inches and feet ) and used product we dont have here – so I sat down to translate it into good ol kiwi English and metric measures. We also got 16 L shaped metal stays to screw into the base of the pit and then drove a rod into the ground to hold it down. Cut the 50 x 100 into 16 pieces, each 500mm long. Glue ( Liquid Nails) the 50 x 75 down each long side of the plywood. Clamp it in place. 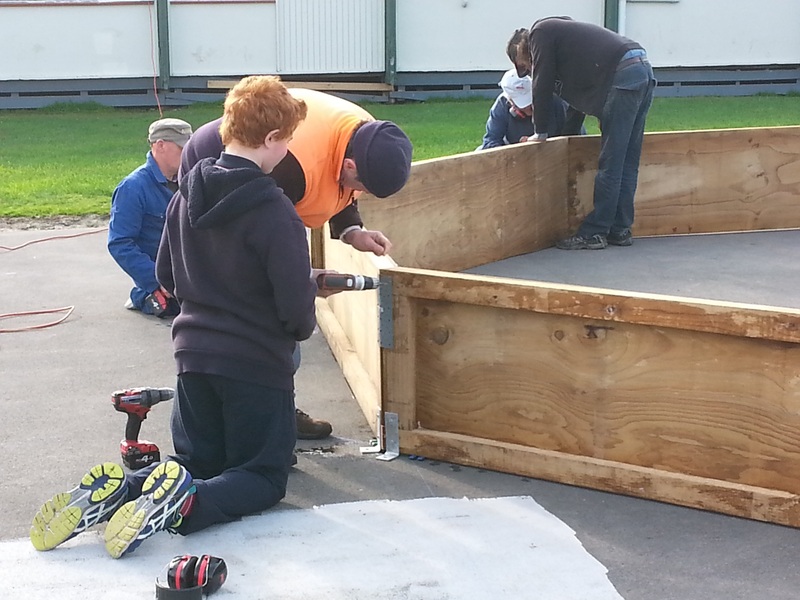 We also flipped the plywood over and drove some galvanised screws through to help hold it in place. Shane’s really cautious and wants to over engineer things. 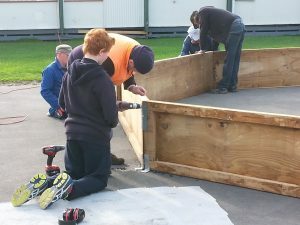 While you are working on each piece of plywood also screw the 2 pieces of 50×100 across the short end of the plywood, between the 50×75. You want to back it about 6-7mm away from the edge as you are going to cut it at 22.5 degrees to make the joining angle. So far the process is pretty much as shown in the Instructables instructions. However we think we might have a few tips for next time. I don’t know what circular saw the guys in the Instructables plans used but even a fairly large bladed circular saw doesn’t have enough depth to cut the entire way through a 50mm thick board at 22.5 degrees. We ended up finishing the cuts with a hand saw following the track the circular saw made. A table say does have a big enough blade, but we have yet to find one that cuts past 45 degrees. Our advice – try the tip above first. 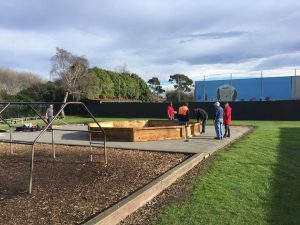 We gathered together on a cold, grey day with power tools, hammers, nails, glue and mountains of hope. Sam and Amy from Bunnings joined us and after a short (but thorough – just in case OSH is reading this) safety briefing we went onsite. Assembling 8 sides of an octagon may sound simple but there are a few gotchas. 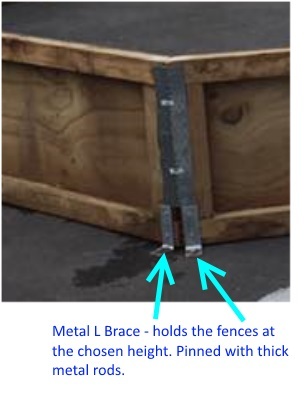 The ground isn’t even – so even if we lay the fences out correctly the joins will be off. Just putting the fences flat on the ground and moving them until they touch corners will be a nightmare as every adjustment throws off the other adjustments. We had pre-made a plan and taken some string, some chalk and a tape measure to pre-layout the location. 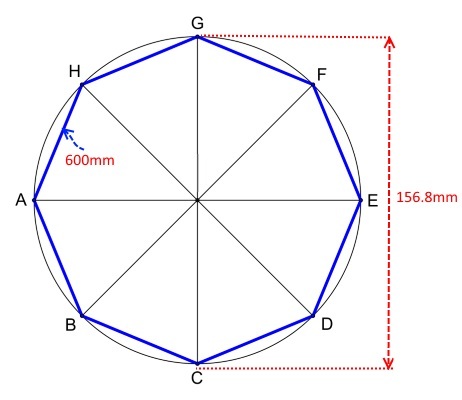 Knowing each side is 600mm long we went to https://www.omnicalculator.com/math/octagon and found the longest diagonal ( 156.8mm – Shane, 157mm – everyone else) you can see our results here. Halving the longest diagonal ( 78.5mm ) we pinned a string at half the length and drew a circle with a radius of 78.5mm. Choosing the first point for the fence to sit we then drew diagonals of 600mm long touching the edges of the circle. 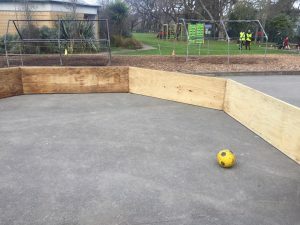 This then gave us a location to place each fence. Thankfully we had lots of hands as the next step was to lift the sides up and see how they fit. As expected the uneven ground meant we had some fences higher than the others. Using string and a spirit level we found the highest point and chose that as our reference point. We then propped the first length of fence up on blocks similar to a tile wedge and screwed the L Plate / brace into the wood to hold it at height. From there was just a matter of using a spirit level, string and patience to get the rest of the wood fence set up. However, be warned, don’t commit yourself until you have all the wood at exactly the right height – as those last join or two can be out despite your best efforts and some adjustment may be required. 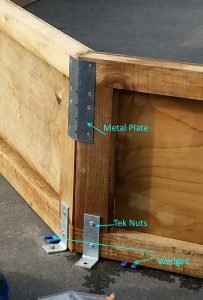 We fixed the L Plates in place with tech nuts and used some 50mm galvanised screws to join the fences. 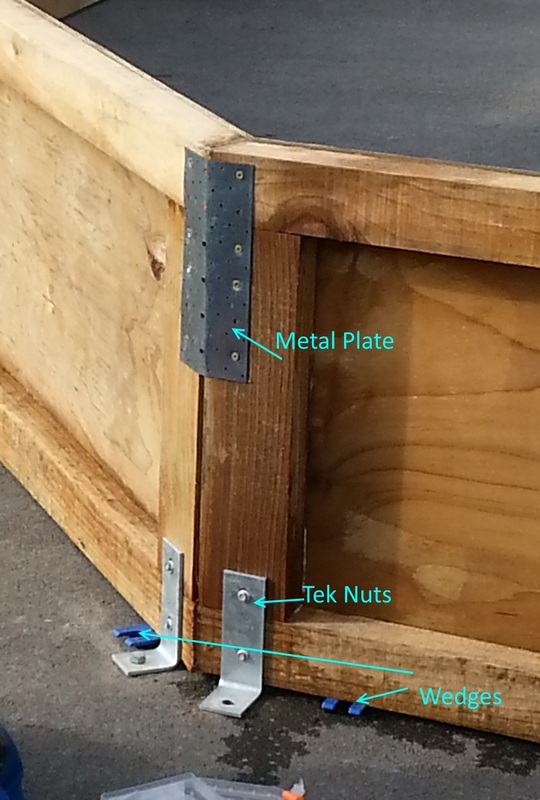 Lastly we drilled in the flat metal plates across the fence joins to help hold the joins together. This probably wasn’t needed but lets face it, kids running around in a small space are likely to push against the walls with some force – and as we all know – more is good. no obe ever complained something was too strong ( actually I’m wrong – accountants keep asking why we spend so much on consumables – sigh – art meets commercial reality). 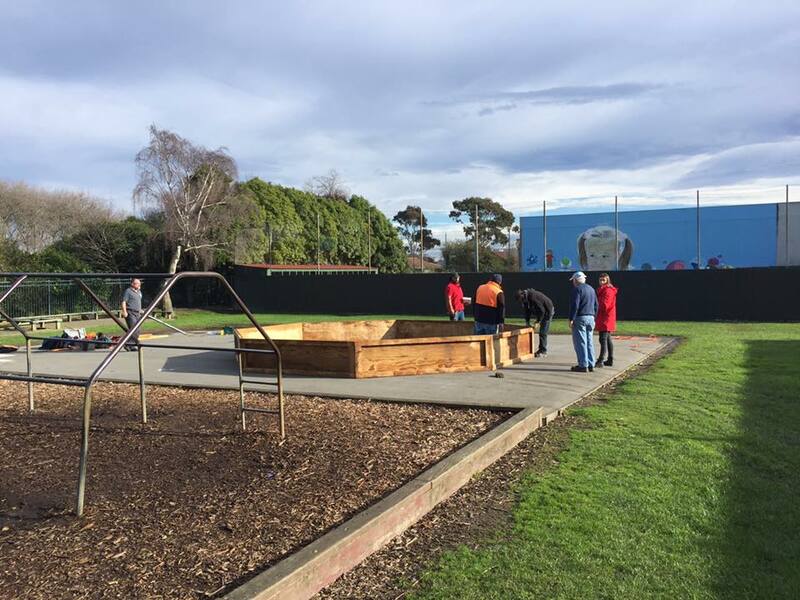 A big thank you to Linwood Primary for supplying so many kids to test the structure out with. Without them it would just be a theoretical if the structure would stand up to wear and tear. 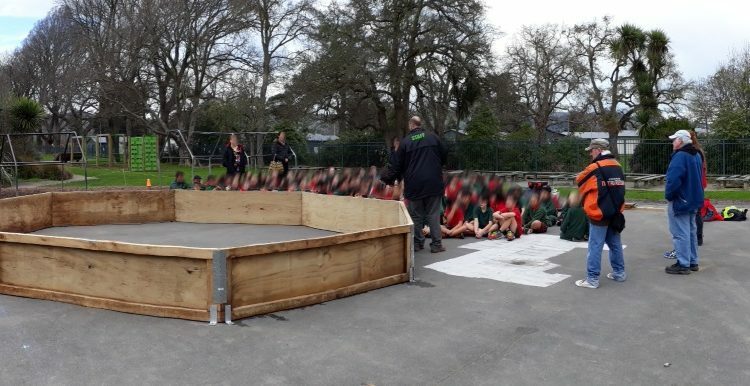 Some of the Menz Shed youngsters wanted a go but realised they would get owned (pwned) by the school kids – so discretion was the better part of valour and we watched. 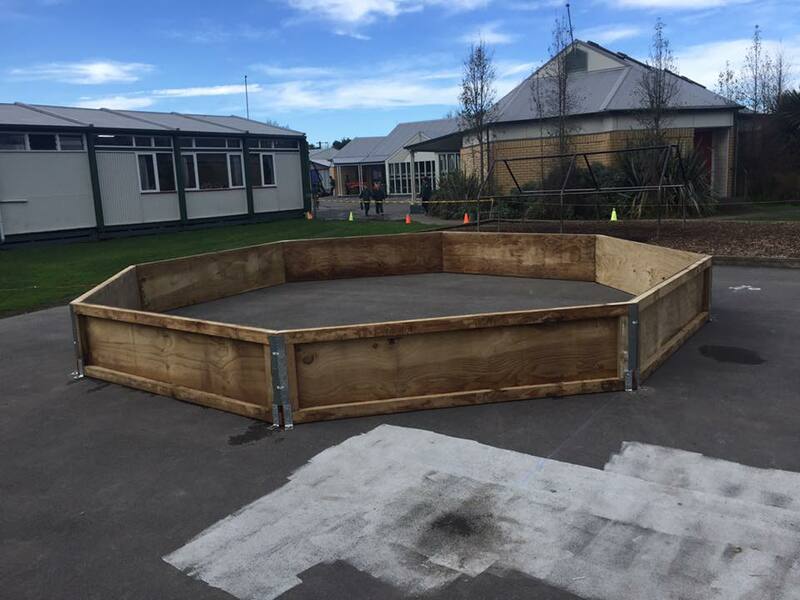 Linwood Primary School posted the following on their Facebook page – it looks great.